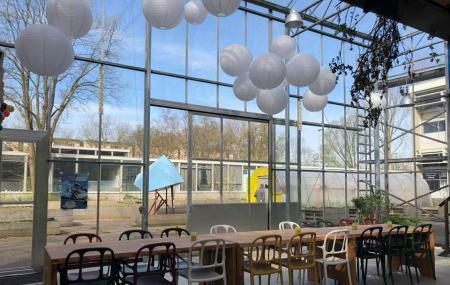 WOW Amsterdam is set in a studio art building and is a funky hostel that offers minimalist and yet stylish rooms along with fantastic amenities, so you can enjoy a comfortable stay. Here, you can choose from four, six, eight or twelve-person dormitories, the family rooms that consists of three bunk beds and can accommodate six people or the double de Luxe rooms which is great for two people and offers wonderful views. Amenities at WOW Amsterdam include free breakfast in a bright restaurant, a shared kitchen, bar, a patio, a lobby and more. I was in a female dorm, I really liked the room which was spacious and had a great view of the town. Each room had a bathroom. For breakfast people had a wide choice of food. The only problem was that the room key demagnetized really often and so I had to go frequently to the reception. The location was not so near public transportation but there were two stops within 10 minutes or maybe less on foot. Staff was really kind and helpful. The hostel is quite far from the center hence their rate. The rooms were nicely designed. colorful and clean too. Light and electrical socket for each bed. Plus, bed is not so shaky. Breakfast is a bit boring though. All in all, I have enjoyed my stay. Staff were cool! This hostel saved our lives! I was in Amsterdam in May 2015 with 3 friends and our ride back to France was cancelled, so we stayed here for one night, paid 13€ and breakfast was also included! The beds were comfy and the bedsheets, towels and everything were all clean. Moreover, we had our own bathroom. The design of the rooms and hostel in general was great, the only problem was that the hostel is somehow away from the centre. Nevertheless, it was a real bargain for us and we really enjoyed our stay there! Good place. Train station 15min walking distance. Easily to get to the city centre. The staff was helpful. Room clean and comfortable. Breakfast could have had greater variety of choices.